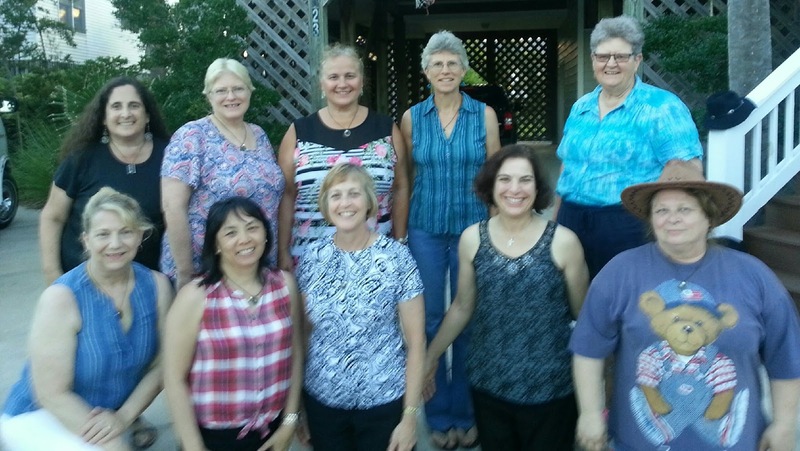 Forty years ago we were a group of ten girls, chosen from across the United States to travel to Japan for six weeks. We toured Tokyo and Kyoto, camped with Girl Scouts and Girl Guides in the mountains near Nagano, and spent most of our time living individually with Japanese families. I remember eating squid pizza and playing pachinko (Japanese pinball). I remember dancing at a Bon-Odori festival in a yukata (summer kimono) and geta (tall, wooden platform sandals). I remember temples and Buddhas and gardens and tea ceremonies, meeting a Buddhist nun, unraveling the mystery of how to take a Japanese bath, and feeling so welcomed by the Japanese Girl Guides, community members, and families who made Japan our temporary home. But mostly I remember the other girls. Who were we then? We were high school juniors and seniors, chosen first by our councils and then by our regions for a Wider Opportunity, now called Destinations. Most of us had been out of the United States before, to Canada or Mexico on a high school trip or another exchange program. Most of us had been to Girl Scout camp. None of us had been to Asia. Who are we now? We are women in the professions: a teacher, a graphic designer, a nurse, a landscape architect, a lawyer, and two doctors, as well as workers in therapeutic recreation, hospice management, and the retail/service industries. We are women who volunteer, extensively. We have all been troop leaders—many with Girl Scouts and one with Boy Scouts. We give our time to art museums and schools, and to animal rescue and legal assistance for refugees. We are women who are leaving a legacy. We have six sons and ten daughters and three grandchildren. We have survived cancer and stroke, we have recovered from alcoholism. We have been through divorce and widowhood and financial upheaval. We are women who represent a microcosm of America: African American, Chinese American, Native American, and Jewish. We are individuals. We are not all heterosexual, we do not all go to church. We are Democrats and Republicans and a few of us are in between. We are women whose lives were transformed by Girl Scouting. For me, the trip to Japan was a life changer, but so was the opportunity to meet girls from all over the United States. I grew up in Boston—the girls from Alabama and Wisconsin were as fascinating to me as anyone I met in Japan. Maintaining all these friendships has been the greatest gift of my years in Girl Scouting. This group gave me a travel companion for a post-college trip to Europe and a roommate when I moved to California for graduate school. It has given me balance and perspective, the chance to have friends outside my usual urban, liberal circle. Most of our reunions have been in the South, although we’ve also met in Boston and Colorado. In 2004 we gathered in Savannah and brought our daughters. We spent a day at the Juliette Gordon Low Birthplace and concluded with a mother-daughter pinning ceremony. I had not done much with Girl Scouts as an adult, but I cried when I pinned my daughter. Girl Scouting, even if you leave it for a time, stays with you. Girl Scouting has also been a huge part of what we’ve passed along to our daughters (and sons). Three of our daughters are currently in or recently returned from work or study in China, and two have been to Japan. Something about the love of travel, the desire for adventure that brought us together 40 years ago, seems to have taken root. And we are women who love to travel. It doesn’t matter where the reunions take place, we always find a lot to do. We swam with manatees outside of Tampa. We saw a show about the Trail of Tears in the Smoky Mountains. We spent an uproarious evening on Tybee Island (outside of Savannah) chasing ghost crabs around the beach with flashlights in the dark. In case you’re wondering, those crabs really can run! We are, perhaps most importantly, women who love to laugh. There are no cliques in this group, no pretense, no competitiveness. We are individuals, but we are woman who know how to work as a team. For a group of middle-aged women traveling together, the chores get done and decisions get made with an amazing lack of fuss. We attribute it to our Girl Scout training. And to our friendship, nurtured for 40 years by a shared sense of gratitude for what life has given us and appreciation of the fact that life has taken each one of us on a very different path. Like it did on our trip to Japan. We spent most of our time there housed individually in homestays. It was amazing, we agreed last week, what different trips we each had, just like in life, of course. And the separateness of our journeys makes it all the more amazing that we’ve stayed together all these years. Who are we becoming? Our stories are not over. We are planning our next reunion for Nashville in 2018, and we are looking forward to more travel, more grandchildren, more adventures. We are women with a lot going on. One of us is working with a local fire department on a county-wide disaster response plan and in 2017 is staging a tornado drill for 250 participants at her local Girl Scout camp. Another is hoping to write a book. One of us is getting married, in just a few weeks! Although a few of us have moved to different parts of the country, the majority live pretty close to where they started out. Internet and smartphones make keeping in touch easy now. I’m just glad we made the effort 40 years ago, back when we had to write letters or wait till 11:00 p.m. for the cheaper long distance phone rates. We traveled across the world together, and we’ve traveled 40 years in time. I am grateful for every step and every second of the journey. There's still time for current Girl Scouts to apply for Destinations in 2017 and 2018, but applications are due soon! Apply today!